The first special woman in almost everyone’s life is their mother, so this Mother’s Day, show how much you appreciate all she has done for you. The most important thing you can do is to treat her with the kindness and courtesy she deserves. After that, whatever she gets is gravy. Since every mother is different, you'll need to determine what makes her happy. Does she enjoy quality time with you more than gifts? Does she prefer handmade gives over something from the store? Come up with a specific treat that shows how much you care about her. Put together a collage of photos from the past. Bring some of her favorite plants and flowers and help her with her gardening. Have an afternoon board game marathon. Put together a list of things you learned from her over the years. Give her the gift of your time and let her decide what to do. 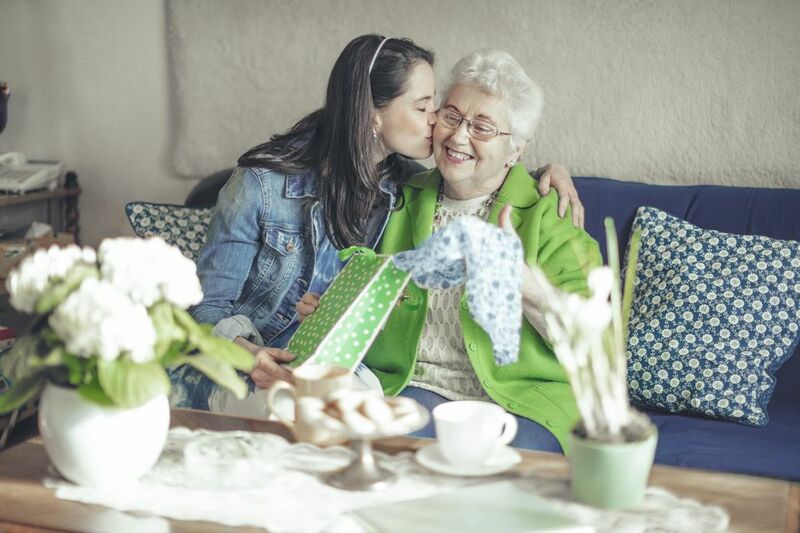 Most of us like to present our moms with a gift they’ll cherish and enjoy. This can be something as simple as a scarf or as elaborate as a trip. Whatever you choose to give her doesn’t have to be expensive as long as you put thought into it and give her something you know she’ll like. Give her an embroidered scarf with her name monogrammed. If you want to win a few extra points, have your birthday (and year) placed someplace discreet, like on the underside of a corner. Have a planner or journal embossed with something personal. If your mother likes to document special events and occasions, she’ll love having a something nice to use. Include a matching pen to make it even more special. Give her a locket with a photo. If your mother has a locket with a photo of her children tucked away inside, she’ll cherish this forever. Find an image with you and all of your siblings to make it even more special. Give her a personalized memento box. For the mother who collects and saves everything that means something, consider getting her a special box to put it in. Pick one in her favorite color and have it personalized so she knows it’s just for her. Subscribe to a magazine that she'll receive monthly or weekly. She’ll think of you every single month when her favorite magazine arrives in the mail. Give her an autographed book. Does your mother love to read? Find out who her favorite living author is and find a way to get a signed copy of that author’s latest published book. Bring her a bouquet of flowers. Choose her favorite blooms in colors she loves, that are beautifully arranged in a vase she can keep forever. Give her a live flower, plant, or tree. If your mother is an outdoorsy gardening type, she’ll cherish a new rose bush, shrub, or tree that will grow and remind her of her thoughtful children. Design an herb garden. If she enjoys cooking, you can make her either an outdoor or indoor herb garden, depending on where she lives. Make sure you label each one, and if she’s never had fresh herbs, include instructions on how to care for them. Give her a cruise or weekend getaway. If you have the financial means, maybe your mother would enjoy getting away for a few days. It would be nice if you and the rest of the family could go with her, but even if you can’t, she’ll appreciate your thoughtfulness. Make sure you cover all expenses and gratuities so she won’t have any unexpected expenses. Whether you get her a gift or not, it’s always nice to celebrate the entire day with her in mind. Plan your whole day around activities you know she’ll enjoy. This is the least you can do for someone who brought you into the world and took care of all your needs. Cook Mom a special meal. If you don’t already know, find out what her favorite special meal is and make it for her. You might have to watch a few YouTube videos and practice a couple of times, but she’s worth it. Make a slide show or video. Get together with your siblings (if you have any) and create a show that will make her laugh, cry, and want to hug the whole bunch of you. Do your best to keep it positive so she’ll enjoy her celebration. Book a spa day. Many moms spend quite a bit of time time taking care of everyone else, and they tend to neglect themselves. If this sounds like your mother, make an appointment for her to be pampered at your local day spa. She’ll love being pampered, having her hair done, getting a massage, and having a pedicure. Don’t forget to include a tip when you pay for it. Treat her to a weekend adventure. Whether she loves hiking and bicycling, or she’s more of a bed-and-breakfast type, plan on spending the weekend doing what she loves. Make it all about her. If you want to give your mother something special that will last all year, consider giving her a coupon book with as many things as you’re willing to do. You can put it in alphabetical or chronological order. Bring her breakfast in bed. Mom can cash in on this when she’s had a rough week and needs a little extra rest. Take her shopping and out to lunch. If your mother enjoys nothing more than a day at the mall and lunch at her favorite eatery, this will delight her and give her something to look forward to. Enjoy a TV show marathon with her. Most TV-watching moms will love having an all-day marathon with their kids. Include popcorn and a favorite drink. Provide housecleaning. Your mom has spent enough time pushing a vacuum and mopping up your messes, so show her some love by cleaning her house. Or if you have more money than time, you can give her a gift card to a maid service. Offer a chauffeur service. Offer to drive your mother (round trip, of course) anywhere she wants to go for a day. Give her a car wash. Having a clean car is a joy, but it’s not everyone’s idea of a good time. Include a coupon offer to wash and detail your mother’s car. Whatever you choose to do for your mom on Mother’s Day will be appreciated. She’ll love the fact that you thought about her and did something to make her day extra special. One thing that will make any of the gifts and activities even more special is to include a thank you note, letting her know how you feel about all she’s done through the years.